Japanese Episode AG 130: "And...The Battle that Can't Be Lost Continues!!" American Episode 400: "A Judgment Brawl"
Satoshi's battle against the formidable trainer Kaede continues as the young trainer sends out his fourth pokemon, Heigani. Kaede sends out her Golduck and quickly orders it to confuse the crab pokemon, but the attack ends up working in Satoshi's favor as Heigani unknowingly KO's Kaede's pokemon. Kaede sends out her Morphon next, prompting Satoshi to recall Heigani and call on his Ohsubame. Even though Kaede's pokemon disables Ohsubame's Peck attack, the bird pokemon is still able to defeat Kaede's Morphon. Next up is Hassamu, who also falls to Satoshi's flying-type. 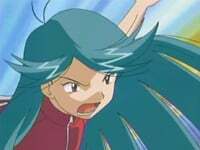 The green-haired trainer chooses Todozeruga as her final pokemon and makes quick work of Satoshi's Ohsubame and Heigani. Satoshi brings out his final pokemon, Juptoru, to face Kaede's ice-type. Juptoru takes damage early into the battle, but Satoshi's determination and Juptoru's relentless attacks allow the trainer to claim victory. Masamune and Tetsuya end up winning their matches as well, enabling them all to advance to the second round. First up...Satoshi vs. Masamune! Masamune is upset at the idea of fighting such a good friend and runs off, causing Satoshi to wonder about his rival's ability to battle the next day. When the time of battle finally arrives, Satoshi's Heigani easily defeats Masamune's Kirinriki due to Masamune's hesitation. The referee asks Masamune to call out his next pokemon, but the young trainer freezes in the middle of the battlefield! Can Masamune pull himself together and fight his friend or will Satoshi win by forfeit? To be continued! This episode concludes the big Kaede battle, and what a battle it is. While I don't really agree with the way Juptoru won against Todozeruga considering the fact it got hit in its friggin' head with an Ice Beam attack, the rest of the battle is still excellent. It's truly the stand-out battle of the Houen League, and I really really really really really really really REALLY hope we get to see Kaede again. The dubbed version continues to torture us with Morrison's horrible, horrible voice. I mean, his VA can't even gasp well, much less deliver any lines properly. His final episode really can't come soon enough. The first three seconds of the episode are removed. Jessie: "Excuse me, sir. You look emaciated. Whatever you desire it's all right here!" Emaciated, huh? I mean...that's a pretty big word for the dub to be using. Yet there are still people out there who swear 4Kids dumbs down the show for its audience. This episode is incredibly boring edit-wise. Not that I'm complaining. The TO BE CONTINUED... screen is shortened by two seconds.